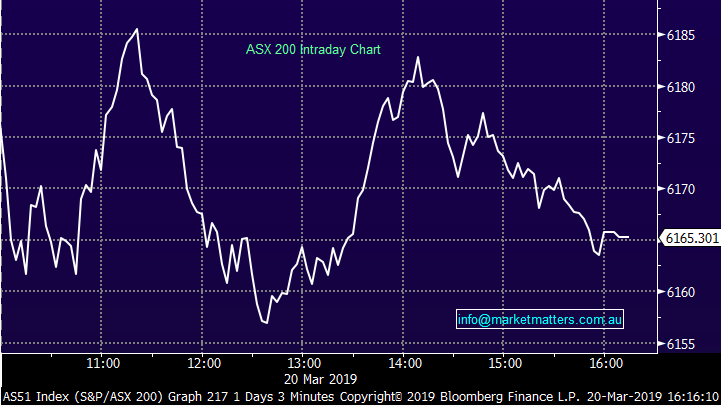 The ASX oscillated in a 30 point range today and was again choppy under the hood – however a more bearish day overall with Materials (for a change) leading the fall. US Futures traded in the red for most of the session while Asian Markets tracked a similar path – China off more than 1%. Tomorrow should be an interesting session kicking off with the US Federal Reserve decision on interest rates at 5am our time with Jerome Powell heading the media soon after while locally, employment data will be released at 11.30am Sydney time – should be a widely watched print given the RBA have hung their hat on strong unemployment as the primary reason to sit tight on interest rates, a weak number tomorrow will obviously open the door for the central bank to act and that would likely be a short term positive for the market. 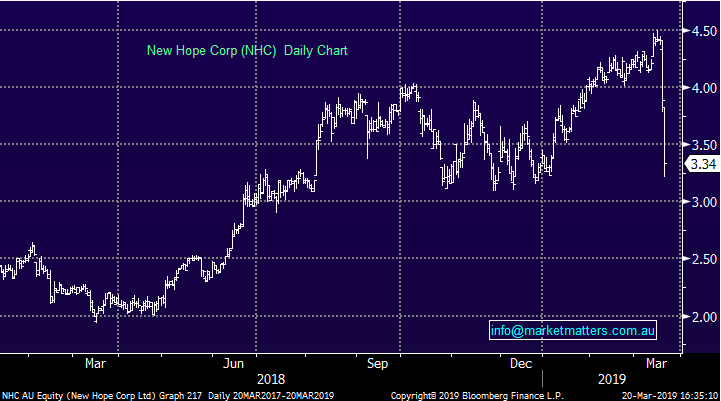 What would worry me is if the number is weak and the market sells off which implies the concern around the local economy is trumping the sugar hit of lower rates. Expectations are for an unemployment rate of 5.0% with 15k jobs added. A lot of stock news today – most on the negative side with two big earnings downgrades from Eclipse (ECX) and Nufarm (NUF) while New Hope Coal (NHC) was slotted again today, down another 14% after falling 11% yesterday after reporting first half earnings while saying that Australian coal cargoes are being diverted away from China while research out this morning was focussing most towards the rise in costs. 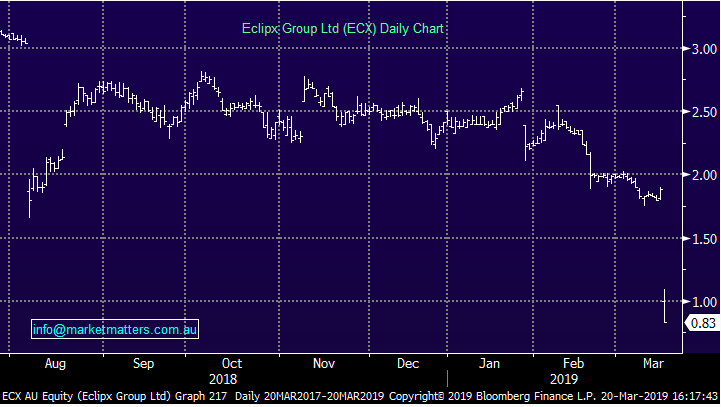 Eclipse (ECX) -55.97% After a two-day trading halt ECX was out today with a pretty astonishing downgrade and the stock reacted accordingly + the proposed deal with rival McMillan Shakespeare (MMS) has been canned. ECX said profit for the first 5 months of the current financial year was 42% lower than a year earlier + they walked away from their full year guidance. In any merger like this there a “material adverse event clause” and a 42% drop in earnings would clearly fit that bill. We’d expect them to cut the dividend and also need to test the carrying value of goodwill in their upcoming results …a poor day for ECX and we don’t see any long term value in the stock at this stage. 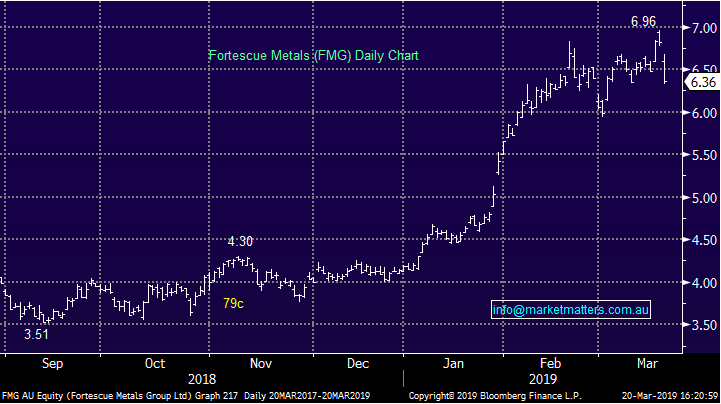 Fortescue Metals (FMG) -6.74% down today after a Brazilian court issued a ruling to allow Vale, the world’s largest iron ore producer, to resume operations at a tailings dam and a mine that was shut on 6 February as a precaution after a deadly tailings accident in the region. This news is an incremental positive for the tight Iron Ore market that moved from sub $US75/tonne before the disaster to above $US90/tonne. We’d expect a more volatile period to now play out ranging between $70-90/t. 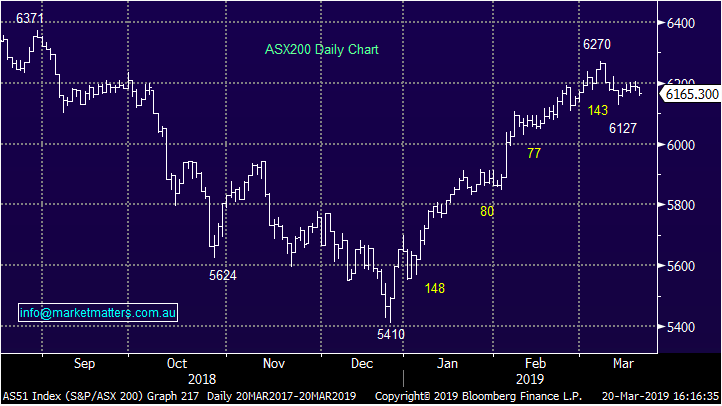 This means the iron ore names will likely pull back from recent near 52 week highs with our call on FMG over the weekend looking a good one. That said, there are a few ways to play FMG from here 1. BUY when FMG heads back to $6/sh or 2. HOLD if you are just sitting in on the medium term EPS upgrades and dividend story. Either way the vale iron ore story is yet to play out and any meaningful weakness would present a buying opportunity. 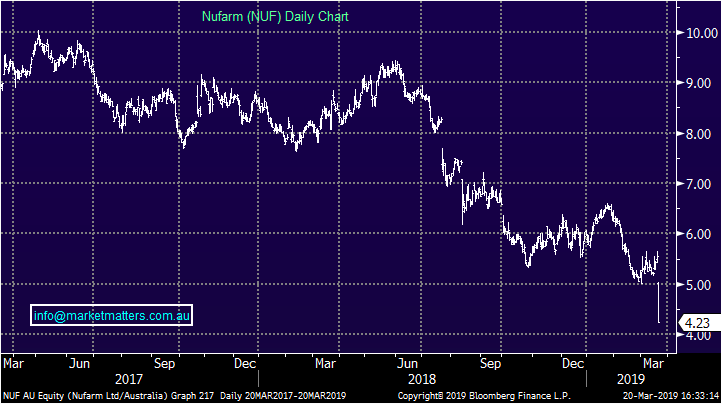 Nufarm (NUF) -23.92% another big hit after downgrading FY19Ebitda expectation to $440 million-$470 million down from $500 million-$530 million + they have temporarily suspended their dividend as they prepare for a tough second half. At the mid-point it’s an 11% downgrade however given the poor guidance and cut of the dividend the stock was hit harder. Glad we avoided NUF and it was largely a result of the MM community being on the ground operating in various industries around the country. 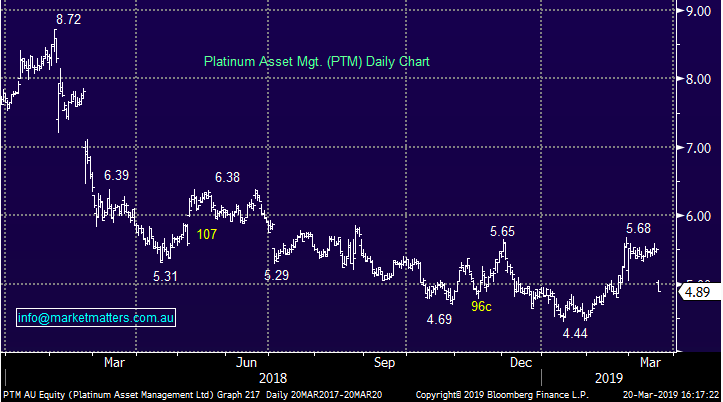 Platinum Asset Management (PTM) -11.09% hit today after Kerr Neilson and his wife Judith sold 60m shares in the asset manager he co-founded many moons ago at a 9.10% discount to the last traded price – the trade valued at $300m. It looked like there were two buyers in the transaction however he’s far from bailing out on PTM – he still owes more than $1.2bn worth of stock in PTM .